I first want to thank you for visiting my blog…for those returning, thank you for coming back and for first-time visitors, I welcome you and I appreciate your time and interest in visiting. I also want to extend my appreciation to ALL of you who have posted comments. Many of you have put a great deal of thought into your comments and I am grateful for your prayers, support, kind words and continued faith. There are many, many comments coming in from all over the world….I have read a number of them and will be sure to read each of them as soon as I can. I want to take a moment to inform you about two important matters. Earlier this week I mentioned the importance of utilizing the latest technological vehicles to communicate directly with you. I am pleased to announce to you here, that we have taken another step towards that effort. The Pilot, the newspaper of our Archdiocese, has created a new and expanded web site. It�s my hope that by learning more about the teachings of the Church and the good works being performed daily throughout the Archdiocese, Catholics – especially young Catholics – will grow more connected to the Church and to each other. You can access the new Pilot web site at www.TheBostonPilot.com, where this week�s Pilot edition has been published. I hope you enjoy the site. I also want to inform you that Boston Catholic Television (BCTV) will hold its 15th annual telethon on Friday and Saturday, September 29th and 30th, from 9am to 10pm each day. The station�s director, Father Robert Reed, will co-host the telethon with Jay Fadden, BCTV�s GM. The telethon will feature 26 hours of entertainment and interviews with the personalities from Catholic TV�s prayerful, educational, and religious programs. BCTV is supported entirely by the generous support of viewers and relies on their telethon each year to help fund the coming year. During the telethon, viewers can call 617-332-8655 to make a pledge or share their feedback. Now, from Rome�.I am pleased to share with you some places in the Vatican that ordinarily people wouldn�t have the chance to see. I guess you could say these are some places located �off the beaten track.� Vatican City is an independent country and it is 0.4 square kilometers in size. Just inside the Vatican gates…past the Swiss Guards and past the Vatican Police gates. The Vatican City has its own very reliable postal service. It�s very famous for its beautiful stamps. A great number of stamp collectors buy the Vatican stamps. 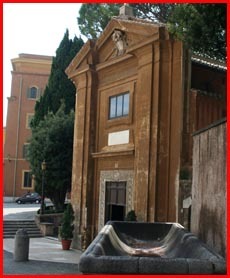 In Italy, a great many people will bring their mail here to have it sent by the Vatican Postal Service. The Vatican also issues it�s own currency and has its own bank, the Istituto per le Opere di Religione. Like the Vatican stamps, Vatican currency is also very popular with collectors. 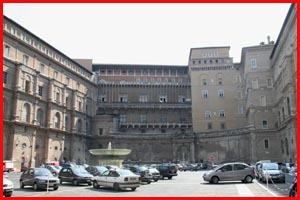 This piazza is where one would enter the Papal Offices and Vatican Apartments. 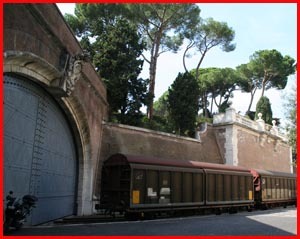 The Vatican has its own train station and train tracks, though seldom used, if at all. The Holy Father, John Paul II went to Assisi on the train. The railway was originally built to transport pilgrims to and from the Holy City. Both Pope John XXIII and Pope John Paul II used it, but rarely. The railway station building was constructed during the reign of Pius XI and opened in 1933. It now contains stores. 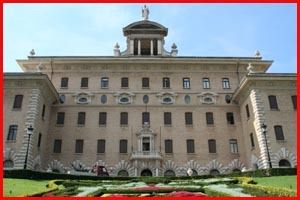 Civil ruler of the Vatican Country, it’s Governor, has offices in this building, Palazzo del Governatorato. 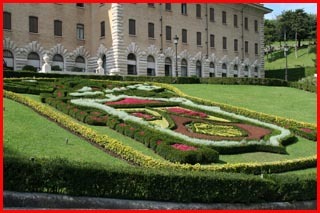 Symbol of the Holy Father, designed in flowers and plants on the meadow in front of Palazzo del Governatorato. 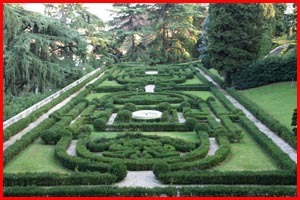 Part of the Vatican gardens. There are several small chapels inside the Vatican grounds. This is St. Stephen�s Chapel. Domus Santa Marta is named after Saint Martha, who was the sister of Lazarus and Mary Magdalene. She was known for her hospitality for Jesus and so this hotel in the Vatican is named for her. 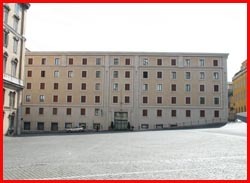 Actually John Paul II had this hotel built so that in addition to having a hotel for visiting Priests, Cardinals and lay people who come to meetings in the Vatican, this is where the Cardinals will all stay when there is a Conclave to elect a new Pope. Formally, they would just camp out, literally, around the Sistine Chapel in very makeshift rooms. So this is a vast improvement. The Conclave that elected Pope Benedict XVI was the first Conclave that used the Domus Santa Marta�.during the day the Cardinals were brought from the Domus to the Sistine Chapel, where the votes actually took place. Side door to Saint Peter’s Basilica. 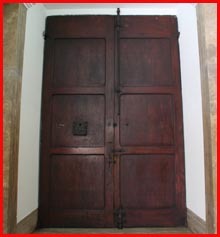 Staying at Santa Marta, it�s very easy to get in and out of St. Peter�s Basilica to say Mass or to make a visit because this side door is available to us to access. When you pass through this door, you are actually in St. Peter’s Basilica. 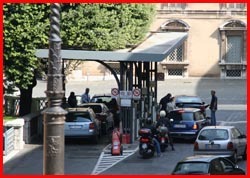 Right in front of the Domus Santa Marta, there is a small Vatican Gas Station that is patronized by residents and employees of the Vatican. The prices are a little better there than out in Rome. It may even be even close to 30% lower in price. One of the newest statues placed in the niches outside and in the back of Saint Peter�s Basilica. 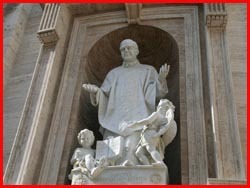 This is a statue of the founder of Opus Dei, Saint Josemar�a Escriv�. The Vatican City ATM machine�.although Latin may be called a �dead language,� in the Vatican it is still alive and is still an official language. 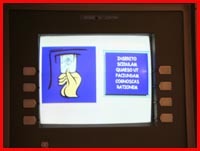 Here we have an ATM machine that gives the instructions in Latin. It may very well be the only ATM machine in the entire world that has instructions given in Latin, lol. When you come in at night, after the Vatican Gates are closed, you would come through here and pass through the Swiss Guards checkpoint. 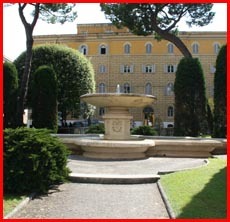 Fountain in front of Vatican Police headquarters. Well, I hope you enjoyed seeing some of the aspects of the Vatican that are seldom seen. As I previously mentioned, I asked one of our own, Msgr. Robert Deeley, to make a guest post on my blog. I thought you might be interested in hearing his persepective on the Church and life in Rome as fellow Bostonian working here in the Eternal City. I hope you enjoy his post…..found below. Buona sera and until my next post�..
Greetings from Vatican City. My name is Msgr. Robert Deeley, a native of Belmont, Mass. 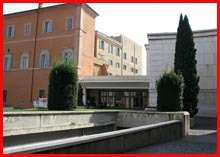 After 5 years serving as Pastor at St. Ann�s in Quincy, I came to Rome to work at the Vatican in September of 2004. I think it is a good thing that Cardinal Se�n is sharing his experiences in Rome with everyone back in Boston. When I had a supper meeting with the Cardinal the other night he asked me to do a �guest-post� on his blog because he felt that you might like to hear about my experience and perspective here as a Bostonian living in Rome and working at the Vatican. I guess this, then, is what you might call �singing for your supper�. In truth I am happy to do it as it lets you know what is happening over here. 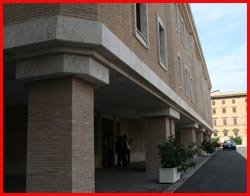 The building I work in at the Vatican is called the Palace of the Holy Office. The Italians, of course, use the word palace for any large building. 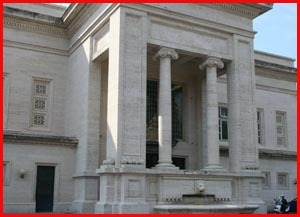 The Palace is the home of the Congregation for the Doctrine of the Faith. When it was originally established in 1542 the Congregation was called the Office of the Inquisition, and later the name was changed to the Holy Office. Since its beginning it has been charged with the responsibility of preserving the faith of the Church. Over the years different Popes have made changes in emphasis. It is Pope Paul VI who gave it the title, Congregation for the Doctrine of the Faith. The Servant of God, John Paul II, then gave new definition to the purpose of the Congregation in 1988. It is charged with promoting and guarding the teaching on faith and morals in the whole Catholic world. The building where our offices are found was already built when the Congregation moved in some 450 years ago. Two families originally owned the building and at that time it was configured much differently. While it�s been rebuilt over six times, much of the structure is original. There are about 40 people who work in the Congregation for the Doctrine of the Faith where I serve. Most are priests but there are also lay men and women as well. There are three different offices�.the Doctrine section concerns itself with anything pertaining to the teaching of the faith in the Church. In that office there are theologians and scripture scholars as well as moral theologians. They are responsible for promoting the faith. Often they give assistance to bishops helping them to deal with issues in their own countries. In their task of guarding the faith they also examine writings and opinions, which appear to be contrary to the teaching of the Church. Another section is the Discipline section. This is the one where I work. We deal with those questions, which affect the way the faith is lived in the world. The priests who work here are often canon lawyers, knowledgeable in the law of the Church. In particular we deal with what are called the �the more grave delicts.� Delict is another word for crime. The Discipline office examines certain grievous acts, which bring serious harm to the life of the Church. They might arise from crimes in which the Eucharist is abused, or the Sacrament of Penance is misused. They also arise from the sexual abuse of minors by priests. Because of the harmful effect these crimes have on people and the Church they are studied in this Office. Finally there is the Marriage section, which deals with certain questions concerning the dissolution of non-sacramental marriages. Under certain circumstances, the persons involved in these marriages can be allowed another marriage. This section works closely with Tribunals around the world in examining these marriage cases. Living in Rome as a native Bostonian has been a great experience. I feel that Rome is a wonderful city, a marvelous city, but, most importantly, it�s �marvelous� because of what�s here. This is the center of the Church. This is where we experience the international nature of the Church, in its very heart, which is the See of Peter. To be here with Benedict, our Holy Father, is a true privilege. It�s a real honor to have been asked to work here, and to be here. Living in the City of Rome presents its challenges � I�d obviously rather be in Boston, or maybe Quincy, with family and friends�.and happily serving in a parish as pastor, as I was before I came over. But, there�s work to be done here and it�s wonderful to be here under the circumstances I mentioned. How did I get here? In the midst of the crisis at home a few years ago, with the number of sexual abuse cases of priests that there were in the United States, the American Bishops realized that the office here in the Congregation did not have enough people to deal with all the cases. So they decided to offer some help. They agreed to send two canon lawyers over to Rome and fund that project for 18 months. In the summer of 2004, Cardinal Se�n concurred with the Bishops and asked me to be one of those canon lawyers who could help in that effort. 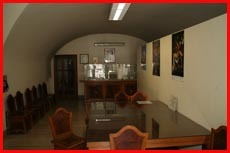 After I was here about six months I was asked if I would stay on and work directly for the Holy See in this office. The head of the Congregation for the Doctrine of the Faith at that time was Cardinal Ratzinger. He is now Pope Benedict XVI. Since I was told he was in favor of the idea I stayed. So, I am still here and now I work directly for the Congregation for the Faith. I expect I will be staying here for a few more years. When Cardinal Se�n and I were meeting the other night, he shared many of the positive things that are happening in the Archdiocese, especially in the healing process, the rebuilding of confidence, transparency and strengthening the Church in Boston. I also receive e-mail correspondence that our new Vicar General Fr. Rich Erikson sends to clergy and staff of the Archdiocese to keep us informed�it�s a wonderful thing, especially for those of us who working away from the Archdiocese so that we can keep in touch with what is happening. Communication is key to any kind of success and it seems to me that Cardinal Se�n is doing that, trying to help people understand better the decisions he makes. The Financial Transparency report that came out a few months ago was a perfect example of communication to the people of the Archdiocese. With that kind of information we can answer the questions that people may have and, then, most importantly, we can get about doing the great work that we are called to do�which is the spreading of the Gospel. Those efforts help in the rebuilding, healing and strengthening process. We have spent a lot of time in the recent past beating up on each other and almost forgetting what the purpose of the Church is�and that is to help us to find our way to God. The first encyclical that our Holy Father, Benedict XVI, wrote is on that very topic – �God is love.� The Pope makes it clear that God loves us first, and in response to that love, we strive to serve one another. That�s the very heart and soul of who we are as Catholic people. We find God�s love in the Eucharist and in all the ways we are loved and served by others. And we, in turn bring that love to others by our service. The Church certainly needs healing. As we go about the work of healing let�s not forget the work of the Church, and the way it is done every day. In our parishes, in our schools, in our hospitals, good things are happening. God�s love is being proclaimed when the sick are able to receive the sacraments, the young come to know more about God�s world, people find a place to mourn their loss, and celebrate life�s joys. God�s love will bring healing. I am often asked about the Holy Father because I am here working at the Vatican. My image of the Holy Father is extremely positive. Since I worked with him for some 8 months before he was elected Pope I came to know him pretty well. He is an extraordinary man to lead the Church. He�s a very intelligent man, but he is also a very humble and holy man. He has a breadth of vision and vitality, which is incredible. He has a strong love of the Gospel and the truth of who we are as Catholics and Christians, which he wants to make known to others. We�ve gone through a terrible crisis recently with the conflict over his speech at the University of Regensburg in Germany. But, in his usual humble way, he has done everything in his power to help people to understand what it was that he wanted to say and reach out to our Muslim friends. The direction that he wants to move things is to help people to understand that without God in our lives and without our belief in God, we are lost�and there would be no meaning to life. The Holy Father doesn�t restrict his teaching just to the universities. He gave a beautiful talk in Munich to the children preparing for First Communion and their parents. He invited the parents to take their children to church on Sunday and to say prayers with them each day at the supper table�very simple ways to remind us about God�s role in our lives. The Holy Father works on many levels. I feel that there are very positive things happening in the World Church under his leadership. We are blessed that he has been chosen as our Pope. 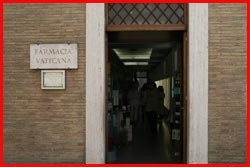 I�m also frequently asked about the workweek here in Rome, being in a different culture than we are used to in the US. We work six days a week. Usually I have Mass at my residence each morning or I celebrate Mass in one of the convents around the city. We start work about 8:30 am and on four of the days during the week, we finish work before 2:00 pm at the office, and on the other two days we come back again in the afternoon for another three hours. We have our �dinner� in the middle of the day, so consequently after dinner, that�s when there�s an opportunity to do the reading and writing that is also part of my job. We have a very busy schedule, but it�s also reasonable. Stores are closed on Saturday afternoon and Monday morning. That�s essentially the �weekend� for the Romans. In Italy, however, more and more, offices are open Monday through Friday. The Vatican retains the �old� schedule. It seems to me that a lot of work gets done at lunch, so therefore the Vatican likes to keep the schedule the way it is. The lay people who work in the Vatican also enjoy the flexibility of the schedule. I do miss Boston, but I was home in July and I�ll be home again in November for a family wedding and Thanksgiving. So I do get back and forth. When I was a seminarian here in Rome some 30 years ago, we called home once or twice a year at the maximum because it was a major effort, and expense, to go about making a phone call. But, nowadays with phone cards, cell phones and computers, you can be reading the Boston papers, or the Patriot-Ledger, in the morning and you can be on the phone very reasonably talking to people back home. So it�s not any different from being stationed anywhere else. But, then you realize that it is 3000 miles away and they use different money over here and they eat much better food! I think that pasta was one of the greatest inventions ever made! But I won�t complain about the food in the North End. It does just fine in comparison. People often say that the traffic here is worse than in Boston. I think that I was well trained in Boston. When I was home this summer, I happened to be there for the joy of having the problems with the tunnel being closed. So the traffic was getting pretty messy. But I didn�t see much difference between that and Rome. The thing about Rome is that the cars are smaller and more of them fit on the street. Add the motorinos, or motorbikes, and there are a lot of small vehicles. They like to squeeze into every corner. You get used to it over time, just like you get used to Boston�.Boston is good practice for driving here. I�ve enjoyed sharing a bit about my work and life in Rome with you. Thank you to Cardinal Se�n for allowing me this opportunity and thank you to everyone who has visited the Cardinal�s blog. God bless you all!